Berg held the distinction of being known as a demanding taskmaster of writers, including Conroy, whom he sought to teach a stronger discipline and dedication in his writing. Shortly after Conroy’s divorce in the early 1970’s, Norman moved him into the guesthouse on his 15-acre estate outside of Atlanta, where he could better focus on finishing his first novel, The Great Santini. I can personally attest to Norman’s impatience and pugnacious temperament because he was also one of my mentors when I was a fledgling publisher’s rep during the same period. I had recently taken a job with Houghton Mifflin, the venerable Boston-based firm that had once published the likes of Emerson, Thoreau, and Longfellow. The rep had once been much more involved in manuscript acquisition, but that role had already begun to diminish by the time I joined Houghton Mifflin. 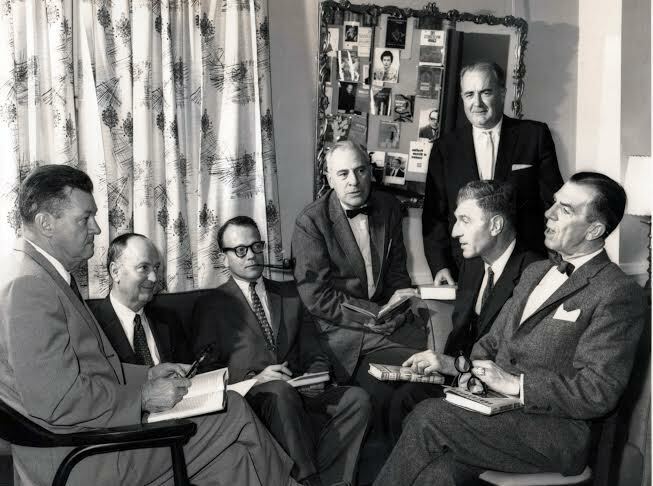 However, Norman worked in an earlier publishing era graced by a certain manner of old-fashioned courtliness—an era defined by the closely inter-connected relationships between authors, editors, and staff members. Berg had been a close family friend of the Mitchell’s and had received a bulking manuscript written by his friend “Peggy.” The story goes that he carried it along on a hunting trip with several friends and finished reading the “rice-paper” pages by flashlight in his tent in the early morning hours. Norman was so excited that he aroused his fellow campers from their sleep to proclaim he had just read a masterful work. Several documentary films and books have been done of Mitchell’s life story and how her famous novel had found its publishing home at Macmillan, but few historians mention Berg’s name as an important link in the process of its publication. But behind the scenes, he was the liaison editor who played a pivotal role in nurturing the book from manuscript to print. He also helped Mitchell navigate the demanding press engagements required during the book’s launch, as well as the premiere of the subsequent film three years later. Knowing she was a private person, Norman helped shield her from much of the veritable media circus that Gone with the Wind eventually generated. At the 1939 World Premiere of Gone with the Wind in Atlanta, Norman and his wife were guests of Ms. Mitchell and her husband John Marsh, as they walked down the red carpet through the crowds gathered outside the Lowe’s Grand Theater. The Bergs entered the theater in fine company with the Mitchell’s, Clark Gable, Carole Lombard, Vivien Leigh, David O. Selznick, Louis B. Mayer, and Mr. and Mrs. Randolph Hearst. Berg had been a close friend of Marjorie Rawlings during the period when she published her Pulitzer Prize winning novel, The Yearling, under the guidance of renowned Scribner’s editor Max Perkins. After Perkins’ death in 1947, she had begun to write The Sojourner, and eventually sent Norman the manuscript asking for his input. He replied with copious notes offering his advice, and ultimately helped shape her final book. Berg’s opinions were likely more direct than Perkins’ had been, but his advice was always precise and valued by Rawlings. By the time of publication in 1953, Rawlings’ health had been severely compromised, but the two of them met more than once in person during their work on The Sojourner, and shared numerous phone conversations. Berg’s ongoing support and encouragement had likely been a lifeline for her during those last years. She died in December of that same year. Their extensive correspondence is now part of an archived collection at The University of Georgia Library. But it was Pat Conroy who became the focus of Berg’s attention in later years. This became the timeless tale of the tough-minded teacher giving life lessons to the recalcitrant young student. Norman challenged Conroy to educate himself with a deeper understanding of the great books, as well as arming himself with knowledge of the larger world around him before “imposing his puny wisdom on an unsuspecting American public.” Berg taught him about the significant books that had made a difference in his own life. Yes, there’s a touch of Pygmalion in this story about the education of a young writer who eventually emerges to find his own true voice. He may have been a tough taskmaster, but was nevertheless, greatly influential in helping Pat Conroy create a literary legacy that will likely endure for generations. This is a great picture of what a dedicated bookman symbolized in the publishing business in an earlier era. Norman was about as pure a book lover as ever carried a sample case into the backroom of a bookstore. Norman’s story adds value and meaning for those of us who spent our working lives passing along the tales of writers—and, in essence, becoming messengers who ultimately delivered the finished book into the hands of the American reader. Even though many of us who worked with him are humbled by his enormous accomplishments, we also feel truly gratified in having shared the same profession with the irrepressible Norman Berg. Bob Vickrey is a former publisher’s representative whose columns appear in several Southwestern newspapers including the Houston Chronicle. He is a member of the Board of Contributors for the Waco Tribune-Herald and a regular contributor to the Boryana Books website. He lives in Pacific Palisades, California.